Are you struggling to make Facebook marketing work for your business? Many marketers don’t know how to connect with their audience on Facebook in a meaningful way for their business. To learn how to get Facebook marketing right, I interview Brian Carter for our new Social Media Marketing podcast. In this episode, I interview Brian Carter, author of The Like Economy and LinkedIn for Business. Brian shares insights into the common struggles and misconceptions marketers have with Facebook marketing today. You’ll learn what to focus your efforts on and a few simple tactics that work. The misconceptions marketers have about Facebook. Brian explains why constant promotion is boring and what marketers should do instead. He describes how marketers should be using Facebook, and if you are not already on Facebook how to check it out and interact. You’ll learn why it’s all about selling the dream and bridging the gap. One thing to do is to have a vision of the life that your customer is trying to live and portray that through photos and maybe even videos. Brian shares some examples of businesses doing this well. One of these businesses creates their own someecards. Discover how you can test this kind of tactic in your Facebook marketing. 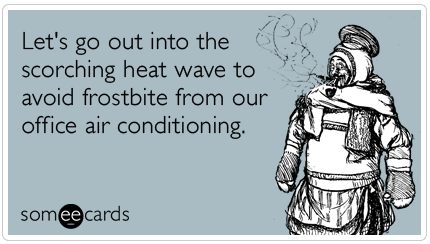 Someecards is a popular, funny, online card site where you can create cool stuff with your own message attached. Listen to the show to find out how you can create cool stuff to get people to start sharing more of your content. The biggest mistakes marketers repeatedly make on Facebook. Brian describes the 5 things you need to do to sell on Facebook as shown on his Facebook Diagram below and outlines the mistakes marketers make at each one of these steps. Once you have your fans and you have reached them, you still need to persuade them. 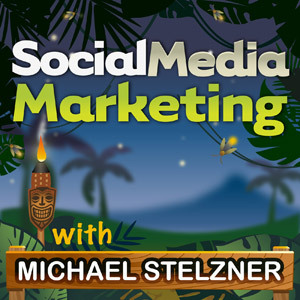 Listen to the show to find out how to make Facebook marketing work for your business. Consider the possibility that your business might be having trouble because people may not be aware of you or they’re not engaging. You might not be showing up in their news feed or maybe you’re showing but they’re not buying for some reason. Look at the metrics to figure out which part you’re having trouble with. Listen to the show to learn how to determine the metrics that matter most to your business. Brian discusses the different options to target B2B customers on Facebook and feed people into your sales funnel. There are a couple of tools for finding out your fans’ likes: Optim.al and Infinigraph. Listen to the show to find out more about qualifying your audience on Facebook. To find out more about Facebook, check out our first podcast episode with Mari Smith, who shares insights on Facebook mobile. Recently Mari Smith and I experimented with this and it really does work. If you want to get maximum exposure for what you share on Facebook, use images to dominate Facebook news feeds. Images grab attention. 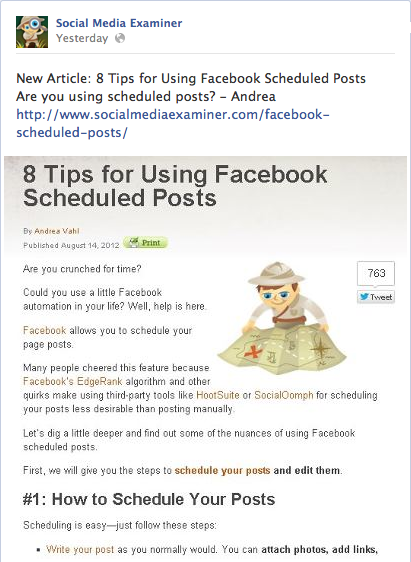 Social Media Examiner posts updates of articles with a screenshot of the article. We have an all-new event coming soon that Social Media Examiner has been putting on for the third year now, Facebook Success Summit. It’s the web’s largest online Facebook marketing conference. Watch the video below to find out how we use Facebook for Social Media Examiner and what we’ve learned. You’ll also hear more about how you can learn successful Facebook marketing strategies and tactics. Check out Facebook Success Summit 2012—tickets are currently on sale for 50% off for just a little while longer. Connect with Brian Carter on his website, Facebook and Twitter. Check out Brian’s books The Like Economy and LinkedIn for Business. Study Brian’s Facebook Diagram to check for Facebook marketing mistakes. Try Someecards and Meme Generator to create images to share on Facebook. Check out Optim.al and Infinigraph for useful Facebook insights. What do you think? What are your thoughts on building a community? Please leave your comments below.